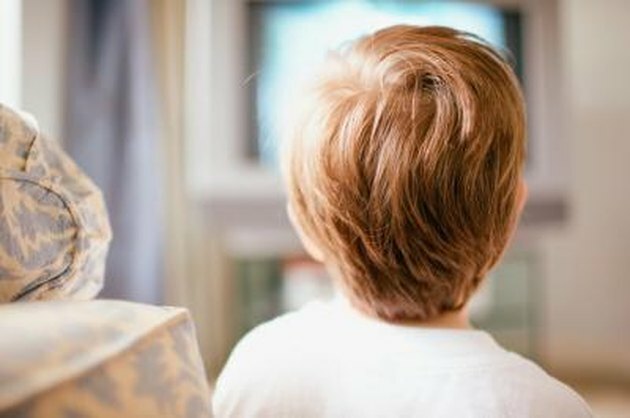 Children under two should not watch television at all, according to recommendations from the American Academy of Pediatrics, and older children should have very limited hours of watching TV. In the real world, parents often rely on television as kind of a de-facto babysitter. It keeps kids occupied while Mom steals a moment to catch up on household finances, chores or other necessary tasks. However, the “TV rots your brain” canard may be overselling the negatives a bit as more and more parents recognize the positive aspects of TV viewing, particularly with so many quality choices available. Television provides a reason for families to spend time together. Parents can still limit viewing by designating specific hours or programs on a weekly schedule. Setting aside some of those hours specifically for family viewing encourages interaction, conversation and togetherness. Whether it becomes a bonding moment with young kids watching “Sesame Street” or endless discussions about the plot intricacies of “Lost” with your teens, television can be a catalyst for family interaction. Educational television puts kids in touch with cultures from around the world in a way that’s deeply engaging. Educational channels like Discovery, The History Channel and especially PBS can expose kids to people and places they wouldn’t otherwise encounter in daily life. Even prime time scripted programming, when age appropriate, introduces concepts that are complex and intellectually stimulating. This can help shape a child’s interest and make him more engaged in classes that deal with those specific topics. There truly is something for everyone on the hundreds of available television channels, and for kids, watching TV in moderation can help develop interests and even inspire further reading on a topic. Parents should be engaged in their children’s television viewing so they can be purveyors of further information. When a child sees something of interest or has questions about a particular topic, parents can use that as a springboard for deeper study. Watching television gives kids whose native language is not English exposure to the conversational rhythms of spoken English. Just like college students taking Spanish are encouraged to go home and watch Telemundo or Univision to develop an ear for the language, students who are learning English can benefit from watching English-language television. Researchers found that television has a social benefit for kids who have difficulty connecting with others, in a study published in the journal Science Daily and conducted at the University of Buffalo and Miami University of Ohio. Shira Gabriel, Ph.D., one of the study’s authors, concludes that “Humans can use technologies, like television, to provide the experience of belonging when no real belongingness has been experienced." The study cautioned that kids withdrawing from family or friends to rely instead on “relationships” built with television characters is maladaptive, but for those with physical or psychological barriers that make social interaction difficult, television can offer some comfort. Does Playing Computer Games Negatively Affect Children? What Are Some Hobbies That Teens Are Interested In?